The guests are from across the country – NFLD to Vancouver Island – and it’s (as always) an amazing group of curious, creative and active (varying levels for sure!) people. What a treat to be here! Then…( I can’t believe I get to top that off with a then ! 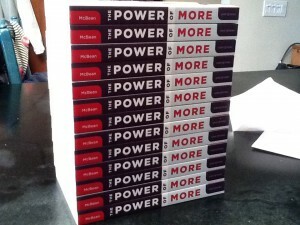 but then I will come home to be joined by a group of family, friends and people who have supported and believed in me as I introduce my book, The Power of More, to the public. I’ve seen one copy so far. It was almost a tease! The day I was leaving for Italy a single copy arrived and – since it was already promised to someone – I wrote a note in it and happily gave it away. So, I am here in Italy, looking at pictures of a stack of books that arrived at after I left. Sometimes it’s really hard to believe this is real. So for now… ciao. The closest to More that I’m getting here in Italy is thinking that every meal that I’ve had hear tasted like more. I think it’s rapidly becoming my favourite flavour! 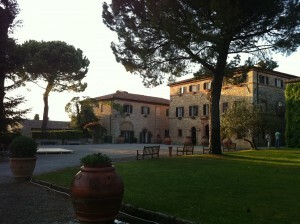 This entry was posted in Marnie's Adventures and tagged Gold Medal Plates, Power of More, Tuscany by Marnie. Bookmark the permalink.